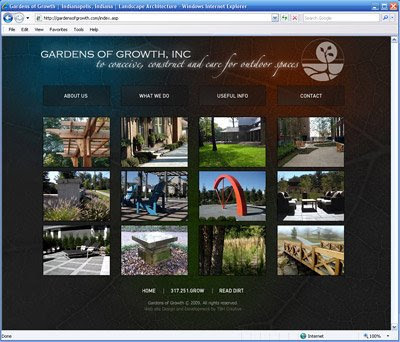 TBH Creative launched the first web site for Indianapolis landscape design company, Gardens of Growth. TBH Creative helped Gardens of Growth define a web strategy, create a design that showed off their creativity and portfolio, and developed validated framework for the site. The web site launched today and you can visit it at http://www.gardensofgrowth.com/. Gardens of Growth is a successful landscape architecture design/build firm based in Indianapolis, Indiana. The firm was founded in 2003 by husband and wife team Adam Garvey and Casey May, who met while studying landscape architecture at Ball State University. Gardens of Growth remains committed to acting as both designer and contractor for each project. While most design/build firms are dominated by contractors, Gardens of Growth is unique in that they are designers first. They approach the design/build process as ‘Master Builders’, where the process of landscape architecture is a holistic approach, with careful attention paid to each phase of the design and construction process. Check out the new site. Looking for a web design firm to build an effective web site for your company? Contact TBH Creative to discuss the details and get started!